The unified term circular bioeconomy still needs much clarification. Or do we rather need a precision economy, in the end? nova-Institute, the German institute that has already made many valuable contributions to the bioeconomy, made a brave attempt to find common ground between the circular and the bioeconomy. Its latest paper, released January 2018, is called ‘The Circular Bioeconomy – Concepts, Opportunities and Limitations’. 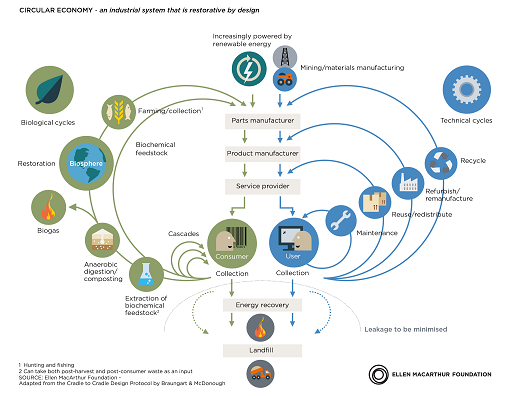 The concept of the circular economy, as propagated by the authoritative Ellen MacArthur Foundation, explains that there are two cycles in the circular economy: the technical and the biological cycle. Almost all attention goes to the technical cycle, characterized by the words Share, Maintain, Reuse, Remanufacture and Recycle. The object of these actions (in this order) is to maintain the economic value of products, materials and resources, as long as possible. And in doing so, use resources to the maximum and reduce the amount of waste to a minimum. The main biological cycle on the other hand runs through degradation of agricultural side streams, providing the mineral and biological resources for new agricultural production. But, as nova-Institute puts it, ‘in reality, the majority of bio-based products enters the technical cycle and only a small share enters the biological cycle (biodegradation)’. Think, for instance, paper and pulp. And biobased chemicals and plastics. So at least, some balance needs to be restored. Will this lead to valuable insights? The bioeconomy, according to the definition given by the European Commission, ‘comprises those parts of the economy that use renewable biological resources from land and sea – such as crops, forests, fish, animals and micro-organisms – to produce food, materials and energy.’ Now this is a very broad definition. But it is generally acknowledged that, both for economic and for environmental reasons, the bioeconomy should ‘cascade’ its use of biomass: process biomass in such a way that predominance is given to the most valuable components, then to the others, in order of their value. 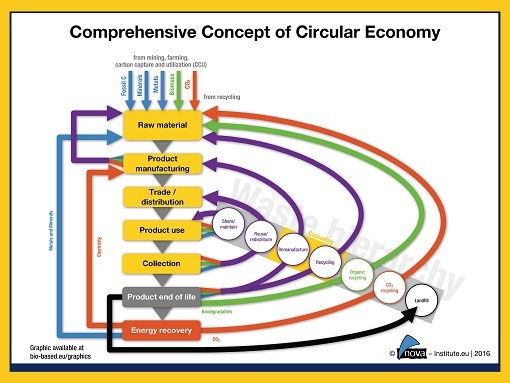 This principle bears much resemblance to the ‘share, maintain, reuse, remanufacture and recycle’ idea of the circular economy, likewise intended to use resources to the maximum and reduce waste to a minimum. The circular bioeconomy, the combination of the two, will result in a much better utilization of biobased side streams, and eventually in linking different industrial sectors, like the food & chemical industries (not foreseen in the circular economy, but a major opportunity).